Invite more white for an effortlessly chic cold-weather look. With gray skies and snow days upon us, we thought it was the perfect time to pay tribute to the color white. Clean, harmonious, luminescent white. White is always on trend and there will always be a place for it in the design world, but it has been garnering special attention as an “It” color this year. 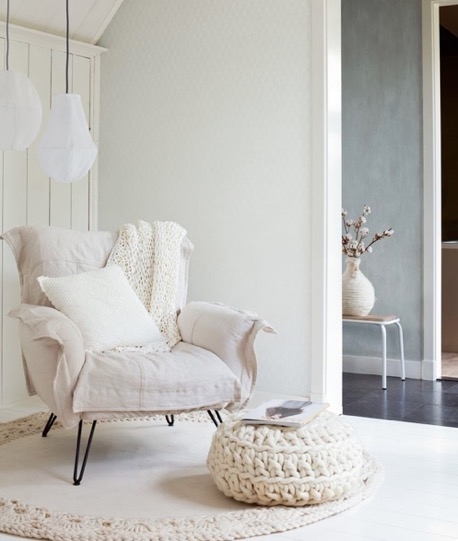 Benjamin Moore even chose Simply White OC-117 as their 2016 Color of the Year. We’re seeing crisp white walls and white interiors everywhere. White monochromatic “roomscapes” are one of the most sought-after requests, according to our designers. Admittedly, not everyone is ready for a 360-degree white interior. It’s a big commitment and we totally get that. But if you like the tone-on-tone look, there are some exciting ways to pull it off on a smaller scale. Take a look at today’s inspiration for fresh new ways to welcome more white into your work and living spaces. We put decorative pillows at the top of the list because there really is no easier way of incorporating a pop of color or, in this case, a pop of colorlessness. White is clean, crisp, uncluttered and has always been a darling of the design world. We like mixing graphic prints and textures such as sheepskin and nubby knits that usher in a cozy vibe. Don’t get too fixated on matching up your whites—in reality, mixing cool and warm whites creates an interesting tonal contrast. White collectible objects are everywhere and chances are you already have quite a few displayed around the house that you can borrow from. The trick to pulling off a grouping of white objects is to select contrasting shapes, textures and even a range of whites and group them closely together on a shelf, coffee table or credenza. We also like to group all-white vases and bowls of varying sized and silhouettes. Even though the look is tonal and minimalistic, the visual impact is quite strong. If you have rich, saturated wall color, try a stark white lampshade or overhead light in a matte white finish for added depth and dimension. The contrast of light to dark is stunning and an unexpected reversal of positive to negative space. 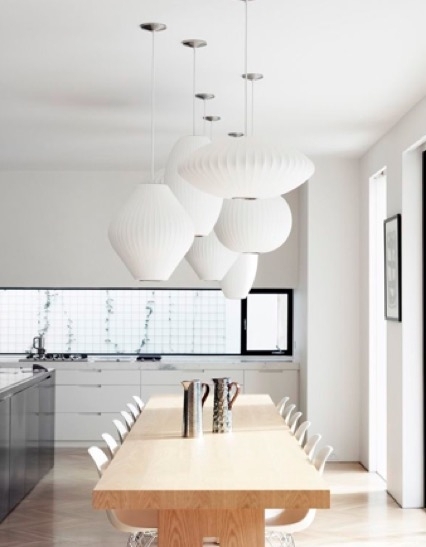 We are also a big fan of the white pendant light in all its full-figured glory. Clustering a group of three or five in varying shapes can give a room a very strong presence and a gorgeous ambient glow—great for dreary winter days and nights. The h sheepskin rug is a perennial favorite and we’ve been seeing more and more of it lately. There are a multitude of different shapes, sizes and styles, but winter white is a true classic that delivers texture and warmth in a bedroom, den or office. We especially like them draped over a simple hardwood chair for a striking soft-hard contrast. 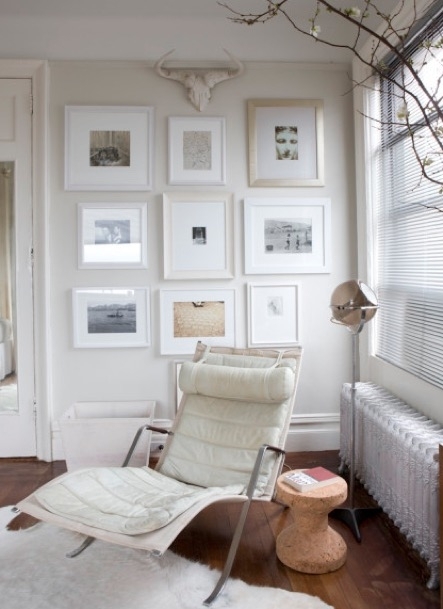 Swapping out wood frames for matte white frames is a simple way to invite more white into your space. The frame becomes a mere mirage and the eye is drawn to the art itself. Try creating a mini “exhibit” of interesting and varied graphic prints framed only in white. Or, if you have black and white photography you’ve been intending to have framed, this is the perfect opportunity to get it on your walls and start showing it a little love. Design tip: If you’ve outworn some of your wood frames, transform them with a little matte white spray paint. This technique works well with ornate frames too. Experiment and have fun. One of the easiest ways to update your existing sofa is to fit it with a custom slipcover in crisp or winter white in your favorite fabric. Heavyweight upholstery like a heavy jacquard, damask or brocade will look the most winterized and will lend a subtle texture and sheen. If you’re in the market for a new sofa and are willing to commit to white year-round, we love an off-white tufted leather design with showstopping impact. Cleanup tip: WineOFF and Wine Away are great for treating red wine stains. We are also ardent users of OxyClean Max Force Laundry Stain Remover Spray, which penetrates deep into upholstery and is relatively color safe. Spot test in a non-visible area first! We love the oh-so-portable pouf in all its diminutive glory. It is one versatile little piece of furniture that serves as an ottoman, end table and an occasional chair. We’re seeing variations on the white pouf everywhere and are especially keen on the wool macro knit styles that evoke a favorite winter sweater and really warm up any space you choose to put them in. If you’d like to take your vision for a wintery white interior and make it a reality, consider online interior design. It's easy and affordable to work with an interior designer to transform your space. Find out more by taking our easy and fun Style Quiz!